There’s been a lot of debate recently about the nacre depth on bead nucleated freshwater pearls, along with concerns about the materials being used as the nucleus. Rather fortuitously while we were making up some necklaces recently and enlarging the drill holes so the silk can be doubled back and hidden two pearls split neatly in half. One was a white 12.6mm Ming – metallic lustre with rainbow overtones and the other was a prototype small Edison white round of 9.5mm and rippled creamier nacre (If you don’t know the two pearl brand names don’t worry, just ignore). 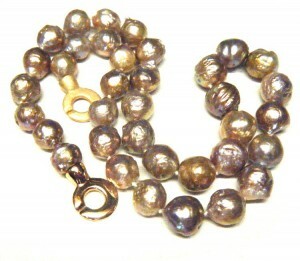 But bead nucleation has exploded onto freshwater pearls in just the last few years. With large grower to wholesaler Grace pearl leading the way Chinese pearl farmers are producing huge round pearls from a schegeli/cumingii hybrid in the most amazing range of colours, some pastel and some deep, such as deep purples, as well as rippled surfaced pearls, nicknamed ripple pearls, with shimmering play of colours and often an effect like gold leaf has been added in patches. You can clearly see the beads and the layer of nacre. 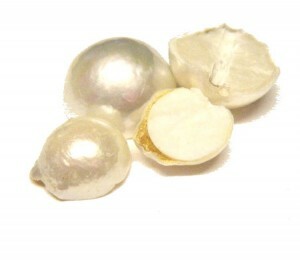 In the smaller pearl the nacre is just 0.6mm thick (minimum depth for a Tahitian pearl is 0.8mm over 80% of the pearl surface) so that would be a fail, while the larger pearl has a happy 1.23mm of nacre. Plenty. This entry was posted in Pearlescencery and tagged bead nucleated pearls, edison pearls, freshwater pearls, Ming pearls, white pearl on March 21, 2014 by WendyG.